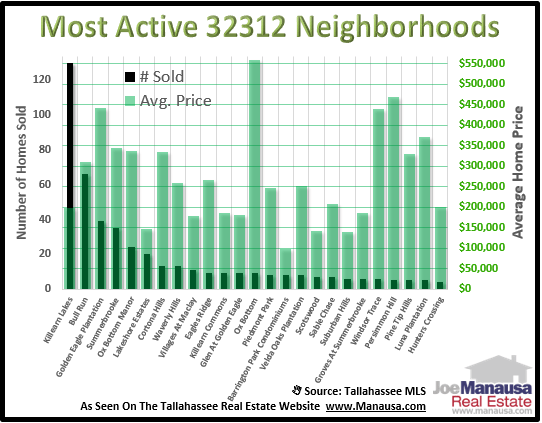 Northeast Tallahassee is the busiest quadrant in the Tallahassee real estate market, having posted 52% of the home sales in 2014. Within this area, the neighborhoods in the 32312 zip code represent much of this home selling activity. Today's report covers home sales in the 32312 neighborhoods from January 1, 2014 through January 10, 2015, and shows key information for both home sellers and home buyers alike. The following real estate graph ranks the top 32312 neighborhoods, from left to right, based upon the number of homes sold over the past year. The black columns show the total number of homes sold (measured on the left vertical axis), while the green columns show the average sales price (measured on the right vertical axis). By way of example, Killearn Lakes recorded 130 closed home sales at an average price of $198,541. Note: We are launching a powerful new property search tool within the next 30 days that updates information from the Tallahassee MLS 96 times per day! The links to neighborhoods in the following paragraph will take you to the search tool, please let us know what you think. Register for a free account to use it, and you can choose to have the tool send you properties that meet your requirements. We're still ironing out the finishing touches on it, but I think you will like how well it works and how the properties are both accurate and timely displayed (check out the polygon search to isolate your favorite area!). Bull Run was the second most active neighborhood in the 32312 zip code, with an average sales price of $309,670 with 66 homes sold. Many of these were new construction, so if you are thinking about selling or buying an existing home, make sure you understand the value differences. Golden Eagle Plantation shows up third on the list, with 39 homes sold at an average price of $441,194, followed by Summerbrooke with 35 homes sold at an average price of $345,463 and then Ox Bottom Manor rounds out the top five 32312 neighborhoods with 24 home sales at a $337,188 average home sales price. Current listings and the complete list of sales in the 32312 neighborhoods can be seen below. The follow table shows the total number of homes sold in each of the active 32312 neighborhoods from January 1, 2014 through January 10, 2015. I hope our report on the most active 32312 neighborhoods answered questions that you may have had, if not you can simply drop me a note with your unanswered question.